by Edited by Ron Geaves, Markus Dressler, and Gritt Klinkhammer. 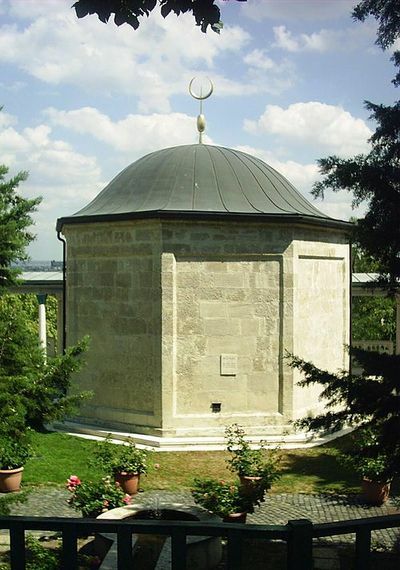 The türbe of Bektashi saint Gül Baba, 16th c. CE, Budapest -- Photograph 2007 Via Wikimedia Commons. These volumes epitomize two related, similar, but finally marginal trends that have penetrated the West in recent decades, and which were inflated in the aftermath of the Islamist atrocities of 2001 and other developments: New Age Sufism and "literary" meditations on the clash of civilizations. In the instance of New Age Sufism, faddish imitations of esoteric Islamic traditions are adopted by Western spiritual seekers. The second trend involves "high concept" meanderings in revisionist Islamic, European, and American history. Both represent attempts to respond to the Islamist challenge without recourse to politics or the military. With the broadening and frequent weakening of Western anaylsis about Islam, both styles of discourse are increasingly offered to the global reading audience. The editors—Geaves, a comparative religion professor at Liverpool Hope University, U.K., Dressler of religious and Islamic studies at Hofstra University, and Klinkhammer, a religion professor at Bremen University, Germany—have assembled a volume striking in its attempt to accommodate academic standards of analysis to Western popular mysticism. Sufis in Western Society emerged from a 2003 panel held by the American Academy of Religions. Its title is misleading in that the collection deals minimally with indigenous Sufism in Eastern European Muslim polities such as Bosnia-Herzegovina, Kosova, or Albania, and the vigorous Sufi presence in such major diaspora communities as that of Germans of Turkish and Kurdish origin (with one exception, discussing Bosnian Muslims in Sweden). Rather, it treats with high seriousness and full credibility the attraction of certain Westerners to religious posturing in Sufi costume. Most of the Geaves-Dressler-Klinkhammer tome describes prominent new age Sufis, some of whom become Muslims but recruit disciples who do not; some who adopt extravagant Islamist positions while projecting themselves as masters of Sufi wisdom; and some who disseminate self-improvement advice with little or no Islamic ornamentation. The volume gives notable attention to such dubious figures as Feisal Abdul Rauf, best-known for his association with the scheme for the "Ground Zero" mosque in New York, and Nuh Keller, the American fundamentalist Muslim convert who published The Reliance of the Traveller, a classic, though backwards-looking, volume of Islamic law. The chapter "Home, Nation, and Global Islam: Sufi-oriented activities and community building among Bosnian Muslims in Southern Sweden," by Catharina Raudvere, a professor of religions at Copenhagen University, and Ašk Gaši, a Bosnian emigrant to Sweden, includes errors but presents a useful profile of a Muslim community in which Sufi influence has diffused into a general Islamic identity. Perhaps the most immediately relevant chapter is "Globalizing the Soundworld" by Michael Frishkopf, a professor of music at the University of Alberta, Edmonton. Frishkopf recounts how, as a proselyte to Islam, he attempted to organize a presentation on his campus by a noted Egyptian Sufi performer of religious songs, Sheikh Mohamed el-Helbawy, with the participation of the University of Alberta Muslim Student Association (MSA). The MSA, a pillar of the Wahhabi lobby, rejected this initiative by declaring that the Egyptian figure represented "innovations in religion, and other matters that are highly doubtful and debatable." This ominous but typical episode presents, in microcosm, the ideological orientation and activities of MSA branches throughout North American academic life. "Global Sufism," a chapter by Marcia Hermansen of Loyola University, includes a brief but similar description of the inability of Barelvi Muslims, a traditional yet moderate trend in South Asian Sunnism, to establish an organization in the United States. She states that "its failure may have occurred as a result of factors specific to the Muslim subculture in the United States, for example, the fact that most community organizations were already controlled by anti-Sufi Islamists." Majid's We Are All Moors is an overly ambitious, rambling, error-strewn, and otherwise contrived book, attempting a meditation on the clash of civilizations. In reality, of course, almost none of us are Moors. Use of the terms "Moor" and "Moorish" to refer to the Muslims who invaded the Iberian Peninsula in the eighth century C.E. was always inaccurate and has been abandoned by Spanish cultural historians, of whose work Majid shows little knowledge. "Moor" might denote a Mauretanian or other black African Muslim, but the conquerors who established al-Andalus were Arabs and Berbers, not Mauretanians. Majid, a Moroccan-American English professor at Maine's University of New England, has constructed a general history of the past half-millennium, in which the expulsion of Muslims from Spain is treated as a kind of historical original sin that may be expanded to explain anti-Jewish prejudice, the Atlantic slave trade, social distinctions among Israeli Jews, and just about everything else that can be connected artificially with Western "hegemony." The effect is to condemn all such interactions as expressions of a "Crusader" mentality which, Majid argues, must be thoroughly repudiated for the sake of the world's salvation. The effort is tedious, and its undeniable political correctness, while doubtless laudable in principle to many of the author's peers, does not rescue the work from the pseudo-intellectual quagmire into which he has plunged. Such a product, as a cry of complaint and nothing more, offers no fresh insights or information, and will be of no use to scholars of Islam or Muslim relations with non-Muslim communities. Indeed, it violates the fundamental rule of such inquiries: Make distinctions; do not confuse them.